Flexible labelling system significantly cuts the amount of time pool/spa equipment manufacturers now spend printing labels. Karl Perry reports. The printer can operate in a completely stand-alone operation due to its ability to be updated remotely with a locally stored database of world-wide customer label templates. With Australian manufacturers looking at ways to make operational improvements, it is clear they should be researching ways to modernise their processes through technology. Smart mobile printers, that is printers that can run printing applications stand-alone rather than having to be connected to a PC, are one such technology that many manufacturing plant managers are turning to for the cost, efficiency and productivity benefits they offer. One leading international manufacturer that was faced with the challenge of modernising their operations to better compete in Australia and globally was AstralPool’s swimming pool and spa equipment manufacturing facility in Melbourne. Brendan Butler, Production Manufacturing Manager with AstralPool said the company had experienced growth of around 20% per year, over the past five years, and was looking for a technology solution that could significantly boost the efficiency of its product and packaging labelling process. 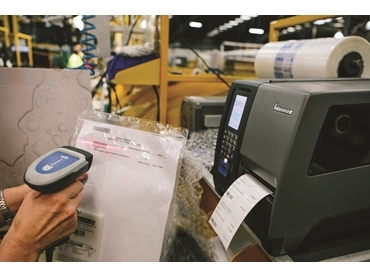 He said, the decision to upgrade was made after many frustrations caused over the past five years by a dated manual process that saw the labelling software system run from a desktop computer connected to a printer which was managed by the production planner. The production planner printed up to 5,000 labels per day prior to the products actually being produced. With the company’s strong growth over the past ten years, the number of labels needed to identify these products had sky-rocketed. The database containing all the different label templates required for each customer had become a complex maze to navigate each day. The main catalyst for change eventually came when AstralPool’s labels were no longer approved for all the markets that they sold into around the world. This predominantly applied to the US market, which began requiring that labels adhered to UL Standards for Safety, the labelling standards introduced in the European market as well as the Australian Gas Association requirements. Driven by the need to source a new labelling solution to meet the UL Standards, which would likely require them to add another labelling supplier to an already long list, AstralPool decided it was time for a system overhaul. AstralPool needed to find and integrate a new technology solution that would allow the company to have one labelling system that could generate a range of labels suitable for all its different customer requirements. It became clear the best option was the Intermec PM43 smart printer: it could operate in a completely stand-alone operation due to its ability to be updated remotely with a locally stored database of world-wide customer label templates, it was a rugged industrial printer easily repaired locally and suited to the factory floor and it had a reliably fast print speed for as-required label printing. [Karl Perry is Product Manager, Printers, with Intermec by Honeywell].